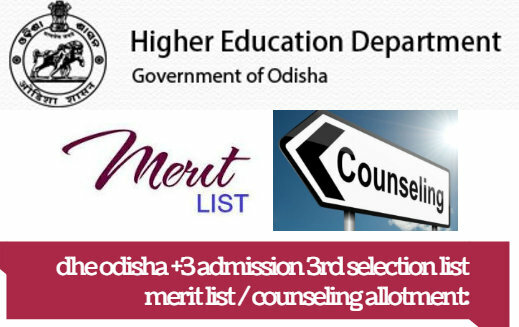 The Department of Higher Education, Odisha (DHE, Odisha) is all set to declare the 3rd Round Selection Merit List for Admission to +3 courses. The DHE Odisha shall release the College / Category wise Rank List / Merit List for (Plus 03) the Category wise. The Department of Higher Education, Odisha (DHE, Odisha) will update the Third Selection List displaying the Academic Session Wise Cut-Off Marks (%) – Junior Colleges / College Wise and Category Wise Rank List Merit List (+3) for admission in Arts / Science / Commerce Subjects at various Colleges under the Department of Higher Education, Odisha. The Admission of the Candidates to +3 in Arts / Science / Commerce Subjects shall commence in the month of July 2019 and come to end in the month of July 2019. The Department of Higher Education has updated the Date in the E-Space in Student Academic Management System. The Admission of the applicants selected in 3rd Round & admission data updating along-with Annexure-7 by the colleges in their e-Space will be held soon. After the final results of the entrance test, DHE Odisha will notify the counseling dates through the public notice on the notice board and official website. All colleges release their cutoff through several numbers of counseling. The DHE Odisha shall update the category wise admission merit list of Schedule Caste (SC); Schedule Tribe (ST); Physically Handicapped/Orthopedically Handicapped (PHOH); Ex-Service Man (ESM); Serving Defence Personnel (SDP); Children of Martyrs (CoM); Oriya Living in Neighbouring State (OLNS) and Outside State Applicant (OSA) as well as; Weight age (WT). For all counseling details, students shall be at the counseling venue to confirm their seats in any particular college in particular course. Students can visit the DHE website for all information regarding counseling and seats in colleges, courses, and fee for the courses. After all counseling process, DHE Odisha will release the final Merit list of the candidates. Selected applicants have to produce the Intimation Letter (or Applicant Copy, in case s/he does not possess the Intimation letter) before the admission committee at the Destination College on the date and time mentioned there in. Applicant has to produce all original documents for verification only at the Destination College. School/College Leaving Certificate issued by the Institution last attended. Article For: Selection List /Merit List/ Counseling Process.